March 1, 2016 March 1, 2016 / Elizabeth T.
Can you all believe it? It’s finally the end of February, which means that winter is almost over! Just a few more weeks, and it’ll officially be spring! 🙂 I can’t be more excited for all of the warm weather and pretty flowers! Haha are you as excited as me? First up is this Provence Calendula Aqua Cooling Sun Spray SPF 50+ from Nature Republic. I’ve always religiously applied sunscreen to my face ever since I was about 17 years old (largely due to the fact that my mom always stressed the importance of taking good care of my skin since a young age). All the way throughout my college years, I’ve always routinely applied sunblock creams/lotions as the last step of my skincare routine. And while I’m used to the texture and “stickiness” of it due to years of wear, I did want to switch it up due to my new job. Since I’m sitting inside the office most the day, I don’t really “need” to use suncreams anymore (I go in very early when the sun’s not too bright, and by the time I leave, it’s dark outside already). But likewise, I can’t really not go without sunblock at all since I don’t want my skin to age prematurely or develop sun spots/dark spots (even a little bit of unprotected exposure can cause the malicious effects to build up). This is when I found this spray form of sunscreen from Nature Republic. Though it’s generally used for the body, I find that it actually works quite well for the face as well. 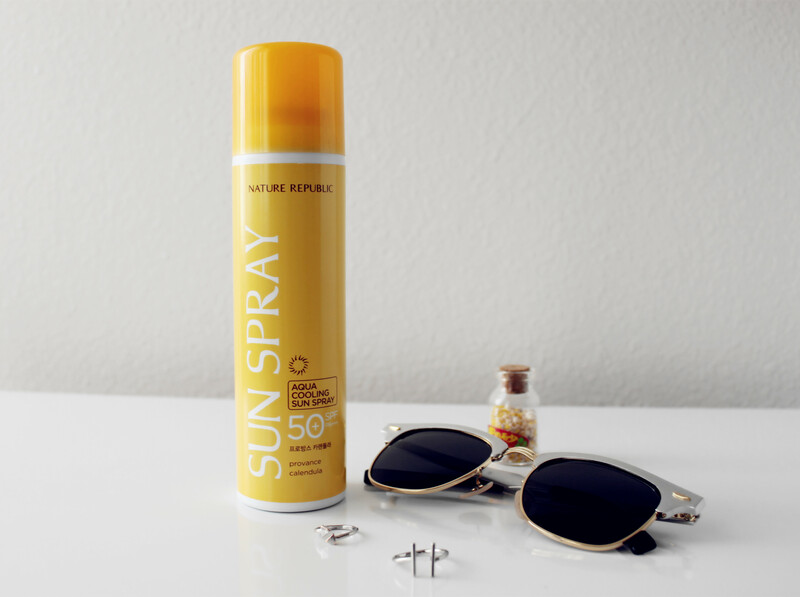 I love how lightweight it feels (especially in comparison to the suncreams that I used to wear before), and it also dries pretty quick (which is perfect since I’m always in a rush in the mornings). The only off-putting thing (for others) may be the fragrance. Don’t get me wrong, it smells so pretty and feminine, but for those who are more used to unscented or lightly scented products, this might be a little on the strong side for you. I really like the smell, though, because it’s so fresh and fragrant 🙂 I’ve been reaching for this almost every morning lately, and I haven’t noticed any new dark spots or age spots developing, so it’s most likely doing it’s job. I’ll make sure to keep everyone updated as I continue using this in the next few months! Up next is the Jurlique Rose Love Balm that Vicky got me as a part of my birthday Birchbox subscription. This product has received so many positive and glowing reviews, and I can definitely see why. It’s infused with natural flower and plant extracts to work anywhere on scaly skin, from elbows, to cuticles, to even lips. I’m absolutely in love with the cute little packaging because it just makes it so convenient to stash inside of my purse or clutch. And what makes this balm even more perfect than it already is is the lovely yet lightly fragrant rose-scent 🙂 Just opening it already makes me feel so pretty and feminine! Other than putting on makeup, I also really enjoy taking all of my makeup off at the end of the day because it just makes me feel so clean 🙂 I take off my base makeup with an oil-based cleanser, and as for eyes, I’ve been using Neutrogena’s Eye Makeup Remover for as long as I could remember (probably ever since I first started wearing makeup, and I never really thought to change it out since it’s very affordable and easily accessible. This past weekend, though, I ran out of eye makeup remover and realized I haven’t had time to restock my supply. But then I remembered that I received a little travel size of Clinique’s Take the Day Off Makeup Remover a while ago from Sephora, so I started using it. 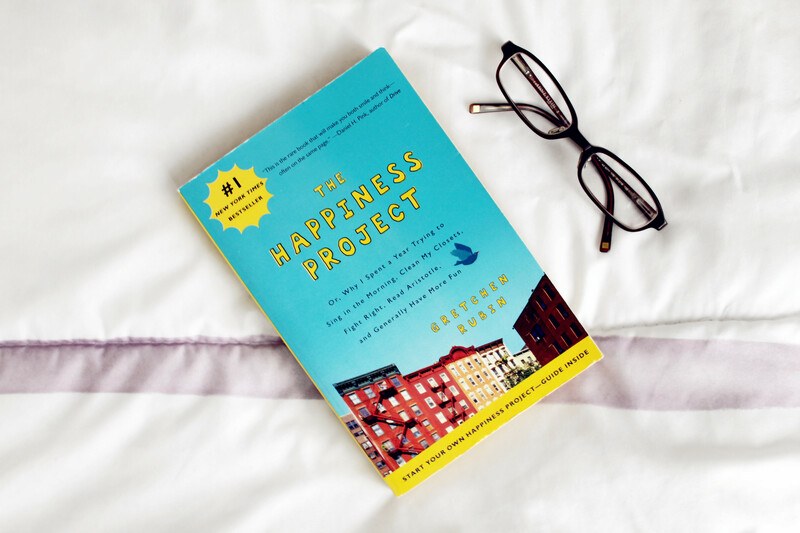 And of course, last but not least is my favorite book for the month, The Happiness Project by Gretchen Rubin. I actually haven’t had time to read this just yet, but I bought it after it was recommended to me by one of my oldest high school friends. Though it may be a “self-help” book, I know that it’ll be a great read, especially for a lost and confused 20-something-year-old like me. It never hurts to read about someone else’s experiences because you never know how it’ll affect or inspire your life 🙂 I can’t wait to get started! 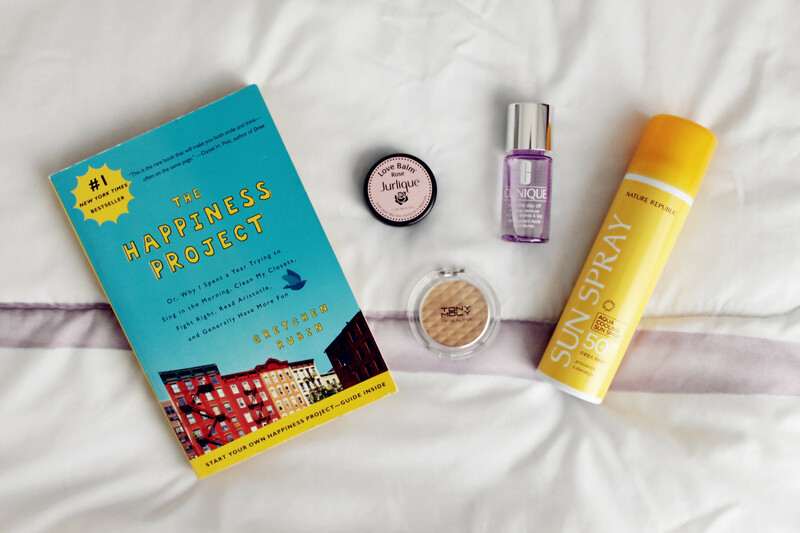 So that wraps up my February Favorites! Hope you all enjoyed it! What were some of your favorites this month? 🙂 Let me know in the comments! I’d love to hear from you! I’m really excited to start reading it too Danielle 🙂 Thank you so much for stopping by my blog! I have to read the book! Perfect picks! I’d love to try that blusher! I’m waiting summer and you shara many products for the hot season! Cute eyewear and I have to check out the book. Check out our latest collaboration with artist Jeremy Martin. i love jurlique, its one of my favourite skincare brands. Have you tried their rose mist? its so hydrating, and it smells really natural and nice! have a great day! Hehe their rose balm is so pretty and smells so nice ❤ And no, I haven't tried it yet, but I must (especially after your recommendation) 🙂 Thank you so much for stopping by Tiffany! That Tony Moly product looks so smooth! Definitely need to try it out, I love Korean products and am interested to see what they do with bronzer, since it’s not a stereotypically popular Korean makeup choice. 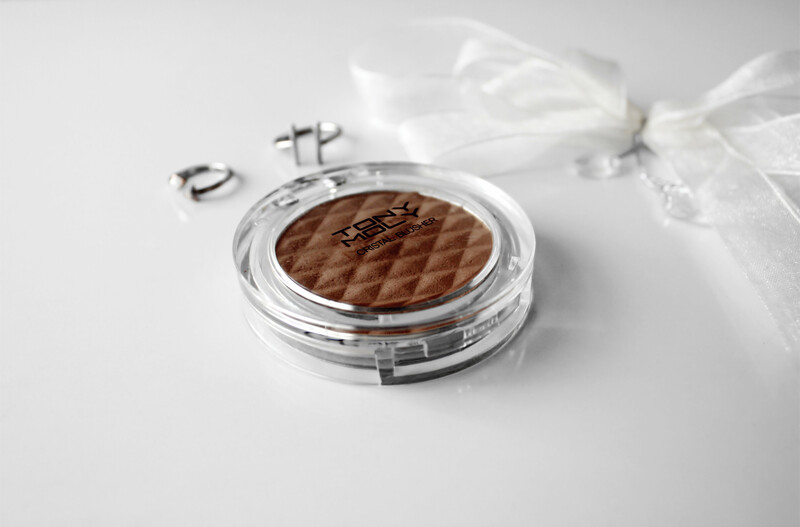 The Tony Moly blusher/bronzer has been my favorite these past few weeks 🙂 It’s very subtle, but builds up quite nicely ❤ You should definitely give it a try! You will seriously love “The Happiness Project”! It is one of the few books that I have read that really changed my life! I read it years ago and I still think about it most days! Love it! Haha I’m very excited to start reading it 🙂 I started a few pages a few days ago, and I’m already hooked ❤ It looks very interesting! Thank you so much for stopping by Annie! Hehehe I’m so excited to start too 🙂 I just read the first few pages yesterday, and it’s very interesting already! I love every single item in your Feb Faves, hon! They all sound/look sooo good! And I can't wait to start reading The Happiness Project! Hehehe it's probably what I'll be doing this weekend 🙂 And thank you so much for the other book recommendation as well! ❤ I always love finding new reads! Hope your week is going well! I’m so happy I found your blog today Elizabeth. 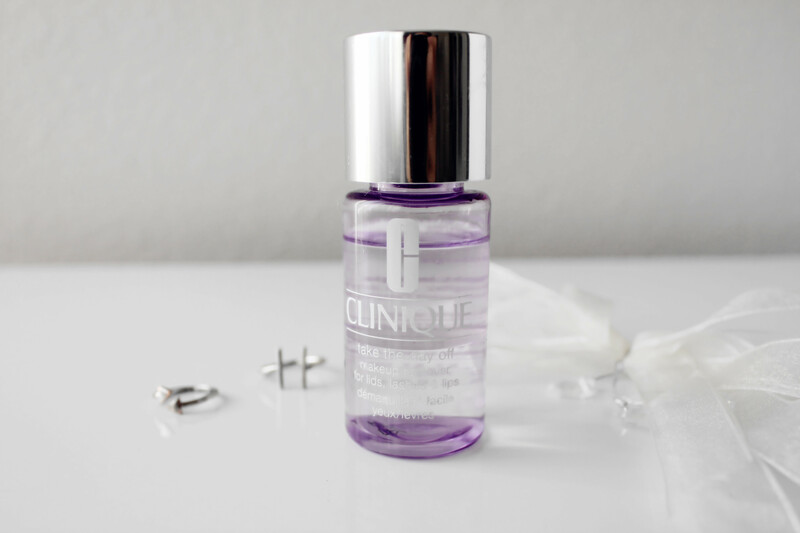 I am a huge Neutrogena Eye Makeup Remover devotee but after reading about Clinique as a new favorite, I need to check it out. I’m a big fan of Clinique as well, have you tried their Moisture Surge Overnight Mask? It has changed my skin during these past winter months for the better! And oh I've heard magical things about the Moisture Surge Overnight Mask 🙂 I'm currently using the moisturizer, and I'm loving it! ❤ Thank you so much for the recommendation! Yes, it’s definitely a wonderful book ❤ 🙂 You'll love it!